Hello, I’m Dominic Wilcox and this is my website. In 2009 I decided to start sharing my thoughts instead of keeping them locked away in a sketchbook. I’m not sure how this website will develop but that is part of the fun. 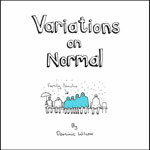 My main projects, like the things shown on this page, can be found on www.dominicwilcox.com. Hope you enjoy! Dominic Wilcox is an artist, designer, inventor and ‘thinkeruper’ who works within the territory of the ‘everyday’. Everyday objects, environments, buildings, human interaction, no area of normality is out of reach. His work, which is usually layered with an ultra dry wit, places a spotlight on the banal, always adding a new, alternative perspective on things we take for granted. His work has been exhibited worldwide and sold in shops such as Moss in New York and Selfridges London. He has been commissioned to create artwork by people such as Nike, Esquire magazine and Helena Christensen’ charities. The design and architecture magazine Icon also features Dominic’s sketched inventions each issue under the title ‘The lost sketchbooks’. After being born in Sunderland, England, Dominic Wilcox behaved as normal for approximately 18 years. He was 2nd best in his art class so on leaving school he decided that he should be a graphic designer because that seemed to be like an artist except you were paid a wage. He then did an Art and Design foundation course at Sunderland University. The Graphics section of the course was led by a conceptual artist called Charlie Holmes. He showed Dominic books full of ideas, inventions and strange things. Dominic saw that there was more to art than painting pretty pictures of fruit or rolling hills. Since then, Dominic has thought up his own ideas and strange things. To cut a long story short he did a degree, then an MA at the Royal College of Art then a creative partnership called mosleymeetswilcox before going solo at the end of 2005. He gets commissioned by people and organisations to think up interesting unique ideas, designs and artwork and he spends time doodling in his sketchbook and making things that get him excited.